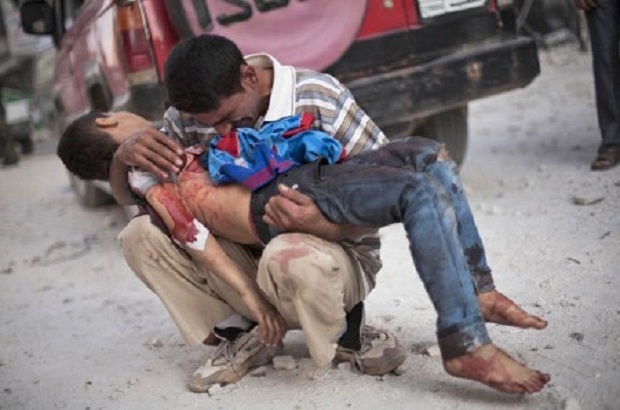 Syria is experiencing political and social crises which is leading to undesirable deadly war. The current political crises in Syria are viewed by the Al-Qaeda offshots, such as the Islamic state of Iraq and Sham and Al-Nusra terrorist groups as an opportunity to establish their own rules and impose their ideological norms on the peoples of the region. At the same the terrorist groups using violence, decapitation, torturing and inhuman degrading treatments as a means to terrorise people and marginalise all freedom voices in Syria. Since the start of the crises and uprising the Kurds and in the absence of regime forces in the Kurdish regions, the Kurds managed through a democratic process to run the affairs of the Kurds. Kurdish people are the only real democratic force that can contribute effectively to the establishment of peace and democratization of Syria. Same as the supreme leader of the Islamic Revolution ”Khomeini” declared jihad against Kurdish people on 19th September 1980 as a result of which hundreds of innocent and civilians massacred, terrorist Jihadist Salafis in Western Kurdistan in Syria today are repeating the history and had declared Jihad against Kurds and according to several international sources and recent UN report around 450 Kurdish civilians including children, men and women have been massacred by Al-Nusra terrorist group and the State of Iraq and Sham organization. These groups are aided and supported by the Turkish government. We the signatories of this press express our genuine support to the democratic demands of the Kurdish people in Western Kurdistan and also democratic demands of Syrian people, at the same time we strongly condemn the savage and barbaric acts of terrorist groups. At the same time we are demanding the European Union, Security Council take necessary and urgent steps in this regards by forming an independent committee to visit the regions in order to provide basic humanitarian needs to the people of Syria and Kurds. More importantly we also demand EU and UNSC to pressurise Turkey on the grounds of State responsibility to stop aiding and supporting terrorist groups in Syria. We the signatory organizations believe the immediate actions are required in order to prevent re-occurrence Darfur Human tragedy in Syria and Western Kurdistan. Current policies toward Syria are inciting and inflaming a deadly racial, religious and ethnic war. The passive and silence position of the European press and Media, which is claiming to be neutral and free is doubtful. A free media must have an effective role to publish the democratic demands of the Kurdish and Syrian people and also display the real image and agenda’s of the terrorist groups. Al-Qaeda affiliated groups and real and serious threat to the stability, freedom and democratic process in the region and the world.